When I was pregnant, I mentioned to an older friend my plan to work from home once the baby was born. "Good luck with that," he laughed. Fortunately, the world has changed since he had kids. It may not be easy working from home, but it's certainly doable, and the benefits can be absolutely amazing. I actually managed to complete a whole manuscript of a book while my baby was between 4-6 months old. Since then, I regularly fit in freelance copywriting as well as working on the next manuscript, too. Sure, work looks different with a baby, but if it is really important to you, of course you can make it work. 1. Use a carrier. When my baby just wanted to be close to me, I let her snuggle up to my chest in my baby carrier. Often she would nap and I'd be stuck with her on me, and that would force me to work at my computer. 2. Work when baby naps. This way you get to concentrate properly, and you can also know that you're giving your baby your all when he's awake. Also, it ensures work doesn't take away from being a full-time mum, if that is your plan. 3. Change your productivity expectations. I have a rule for setting deadlines. If the job will take a few months, I allow myself an extra month. If it takes weeks, I give myself an extra week. If it takes hours or days, you get the picture. Add in buffer time. This means you can be flexible to meet the unpredictable needs of your baby and not be stressed out trying to meet a deadline. 4. Set a half hour rule. When you get to work time, commit to giving it everything you've got for half an hour straight. No social media, no phones, no cleaning or hanging washing up. You can do all the other stuff once you get through the half hour. Maximise your productivity in the little time you've got, because we don't have time like we used to for procrastinating. I've also learned that baby sleep cycles are about half an hour, so that's the minimum time I plan for, and any time on top of that is extra. When my baby is asleep, I race out, make a cuppa, and sit at my computer. I commit to writing 500 words or reaching half an hour, whatever comes first, before I can do anything else. 5. Do your thinking when you're mindlessly doing baby things. We spend so much time doing baby things - nursing, rocking, sitting, watching, driving around town while she snoozes in the car - so much time to be brainless or to get all your strategic planning and thinking done! When I rock my baby to sleep, or go for a walk with the carrier/pram, I go through all the things I used to be able to sit down and think about. I write the first paragraph in my head. Then when I get my half hour, I am bursting and ready to go right from the start. If you have a newborn, it is so much more important for you to rest than to get straight back into work. Give yourself the rest and bonding time with your new bub. You'll never regret it, but you might regret going straight back to work. Start slow. It might seem like you are super ready to get back into things, but it won't take long before you realise you can't work like you used to on little to no sleep. You can't concentrate and take as long to do things as you used to, either. Your 'baby is sleeping time' isn't just for work, either, it's for all the other things that still need to get done, and, importantly, for 'you time' too. No matter how confident you feel, give yourself some flexibility when you start back working, and don't over-commit. Get used to how it feels and fits with your new life before getting back into the full swing of things. Even solo businesses/freelancers are entitled to maternity leave in Australia. The government provides this if you don't have an employer. In Australia, all working women are entitled to a minimum maternity leave, regardless of what your employer offers. Make sure you know what you're entitled to so you don't get pressured into starting back before you need to. 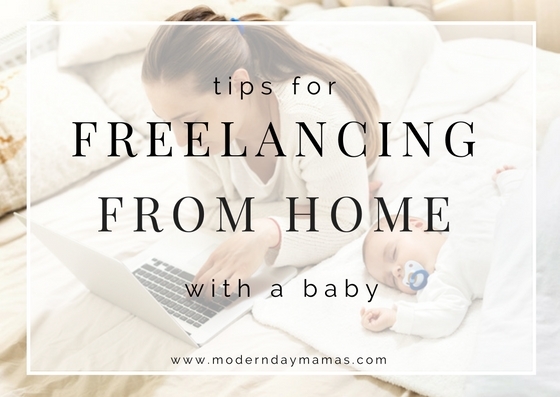 What is your best tip for other new mamas hoping to work from home?